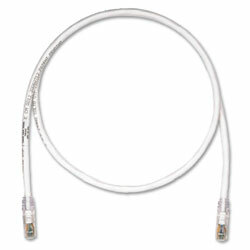 10Gig patch cords are 100% tested to deliver optimum eletrical performance. Featuring an RJ45 plug with an integral pair manager, patch cords provide operation in the center of the TIA/EIA component range. The integral pair manager delivers interoperability and the highest electrical performance when mated with 10Gig jack modules.